Want to get away to a real cabin in the woods ... but don't want to totally rough it? Then this could be your perfect choice. The Hidden Hollow Log Cabin stands 3-stories tall, built into the top of our hill, an eighth of a mile from the last road. It's on 2.5 acres of secluded ponderosa pine between downtown Flagstaff and Snow Bowl off of Route 180, also known as Fort Valley Road. The Coconino National Forest borders one side of the property. You won't find many true log cabins in Flagstaff. This cabin is one of the few with no stucco or drywall anywhere. It was constructed from massive Canadian spruce logs. 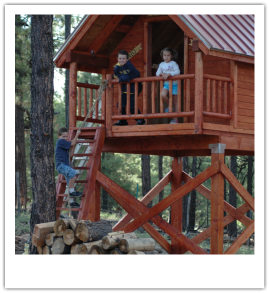 Perfect for small families or groups of up to six at a time (especially ones that like tree houses). Besides enjoying private views of the San Francisco Peaks (elv: 12,643 ft) from the wrap-around porch (elv: 8,000 ft) or upper balcony, take a hike on the forest trails just steps away or get to Snow Bowl in winter (turnoff is 5 min drive) for some skiing or snowboarding. The “Things to Do” page on this website will give you lots of other ideas of places to visit during your stay.